The CFC had a very productive meeting with Intersite (PrasaCRES) and Metrorail (PrasaRail) today regarding a Memorandum of Agreement with them in relation to filming at Cape Town Station. 1)The station is open for filming! 2)Today’s agreement will be fine-tuned over the next few weeks through interactions between Intersite, the CFC and legal advisors. 3)An MoA will be signed between Intersite and the CFC in the next few weeks following consultation with the legal team. Permits can be applied for through Neil Engelbrecht at nengelbrecht@prasa.com. 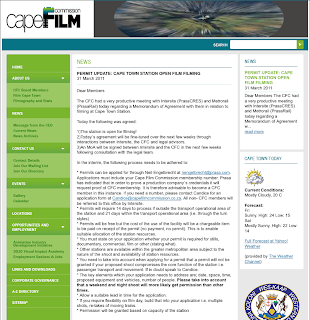 Applications must include your Cape Film Commission membership number. Prasa has indicated that in order to prove a production company’s credentials it will request proof of CFC membership. It is therefore advisable to become a CFC member in this instance. If you need a number, please contact Candice for an application form at Candice@capefilmcommission.co.za. All non- CFC members will be referred to this office by Intersite. Permits will be free but the cost of the use of the facility will be a chargeable item to be paid on receipt of the permit (no payment, no permit). This is to enable suitable allocation of the station resources. You must state on your application whether your permit is required for stills, documentary, commercial, film or other (stating what). Other stations are available within the greater metropolitan area subject to the nature of the shoot and availability of station resources. You need to take into account when applying for a permit that a permit will not be granted if your proposed shoot compromises the core function of the station i.e. passenger transport and movement. If in doubt speak to Candice. The key elements which your application needs to address are; date, space, time, proposed equipment and vehicles, number of people. Please take into account that a weekend and night shoot will more likely get permission than other times. Allow a suitable lead in time for the application. If you require flexibility on film day, build that into your application i.e. multiple shots, re-takes of moving trains.